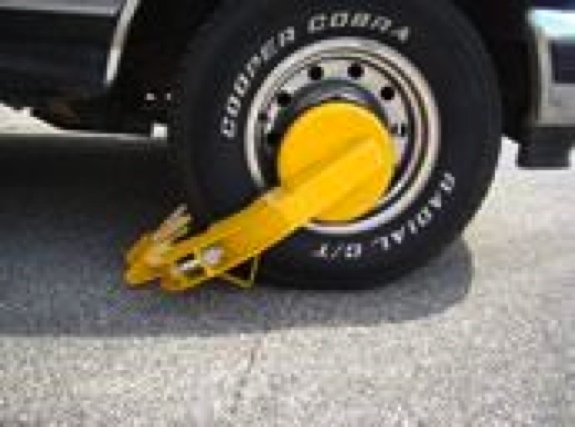 The Heavy Duty Wheel lock will foil the plans of thieves and vandals. Shown here attached to a wheel making it impossible to easily steal your equipment and ruin your day.This wheel works on everything from utility vehicles and trailers to cars and pick up trucks. Prevent the theft of your mower, compressor, John Deere Gator, tractor, golf cart, ATV, motorcycle, trailers or any other wheeled equipment that is prone to be stolen. Very similar in looks and application to the famous Denver Boot, which is used by cities to lock the cars of parking ticket scofflaws. The Heavy Duty Wheel lock is adjustable in width and comes with keys. Stop the thieves from moving your equipment from where you parked it and send them somewhere else to do their misdeeds! This is also an excellent tool to prevent parking in unassigned areas at your office, apartment complex, school, etc.